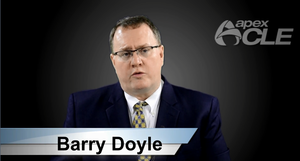 Barry Doyle is the founder of the Law Offices of Barry G. Doyle, P.C. with offices in Chicago and Orland Park where he is engaged exclusively in the representation of plaintiffs in complex personal injury and wrongful death litigation, with a special emphasis on nursing home abuse and neglect litigation. A native of Evanston, he attended high school at Evanston Township High School and then went on to the University of Michigan – Ann Arbor where he graduated with a Political Science degree in 1991. He then attended law school at Loyola University of Chicago, where he graduated with honors in 1994. During his time at Loyola, he received American Jurisprudence Awards in 5 classes. He is a member of the American Association for Justice, the Illinois Trial Lawyers Association, and the Illinois State Bar Association. He belongs to the American Association for Justice Nursing Home Litigation Group. He is a past co-chair of the Tort (Personal Injury) Litigation Committee of the Young Lawyers’ Section of the Chicago Bar Association and a former Adjunct Professor at Loyola University of Chicago School of Law. He has tried over 50 matters to verdict in jury trials, bench trials, and binding arbitration hearings. He and his family live in Evanston.